Flowers are having a bit of a moment with botanical arrangements adorning shop fronts and interiors, and flower fields becoming a popular attraction across the UK. 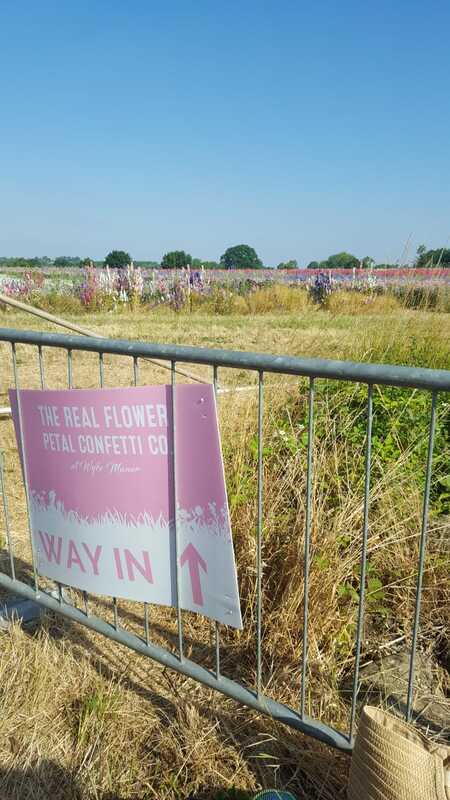 Worcester’s Confetti Flower Fields are but one of a few flower fields available to the public in England – but you’ll have to be quick, they’re only open for two weeks during Summer! The Real Flower Petal Confetti Company are the UK’s original wedding petal growers, hand picking natural, biodegradable confetti since 1997. 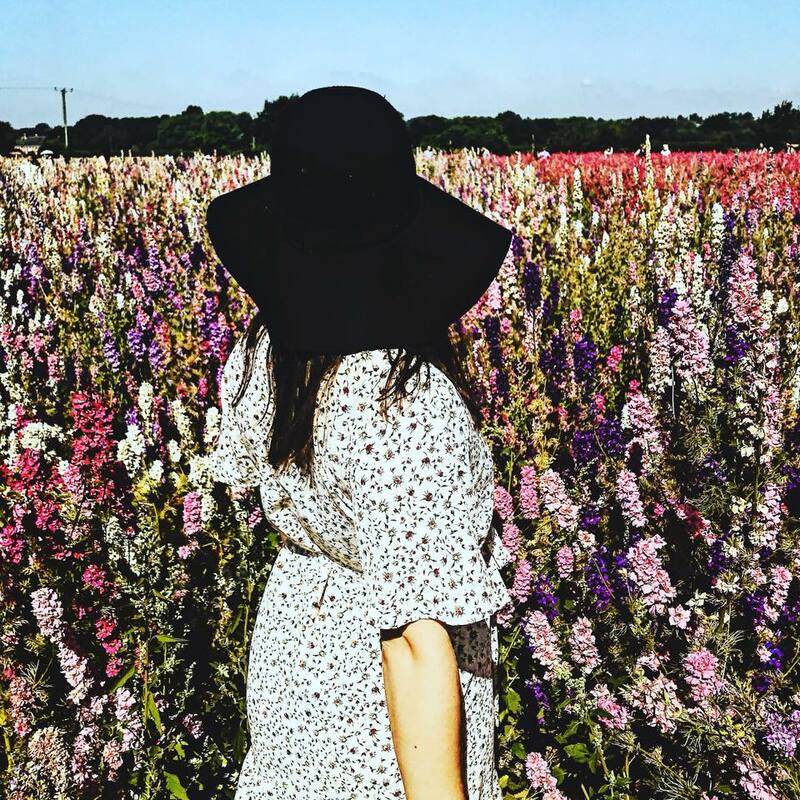 For just ten days a year, the flower field is open for you to soak up the colours of delphiniums and cornflowers blooming on the Wyke Manor Estate before the harvest begins. When I visited the flower fields in 2018, they were open from 29th June – 8th July 2018. For 2019, the flower fields are open from 28th June to 7th July 2019. Please be aware that the flowers are the living crop of the business. Take care not to walk far into the flowers. Stick to the dirt roads so as not to trample the crop. Given its remote location, it’s recommended to drive to the flower fields as it was surprisingly easy to reach despite being hidden behind a small Worcestershire village. The official postcode is Pershore, Worcestershire WR10 3PA. Being on the estate of a manor house, the fields aren’t recognised as an attraction on the Sat Nav. So we set the directions to reach ‘Pershore Bridges’ which is a public car park located nearby. Coming from Bristol, we plugged in the Sat Nav heading North. We exited the M5 at junction 9, and followed the directions through small villages to reach the B4084 in Pershore. Instead of turning left to reach Pershore Bridges, we turned right and took the second turning into Wick (Cooks Hill). There is clear sign posting on the B4084 to help you find your way. Winding down a small country lane, we eventually reached a left turning that, down another dirt track led us to the grassy car park. Free parking is available on site with plenty of spaces available. The car park is a grassy field before the entrance with clear guidelines as to where to park. Our plan b would have been to park in Pershore Bridges and walk down. The fields are open every day from 10am to 4.30pm. Visiting on the final weekend – and a Saturday at that – we were anticipating large crowds. 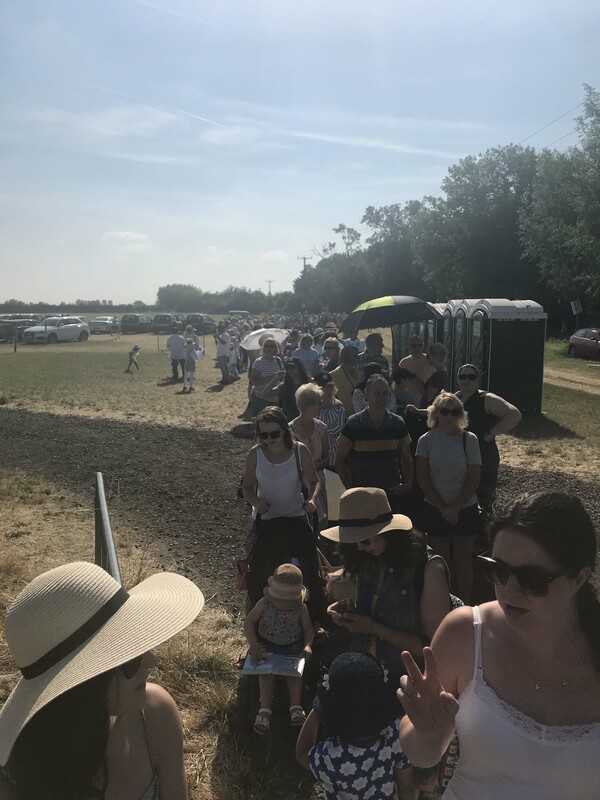 The fields officially open at 10am, but we took our chances at parking sooner to try and avoid the crowds. After completely overestimating the time it would take to reach the fields from Bristol, we arrived at 8.30am – an hour and a half before opening. Unsurprisingly, we were unable to gain access to the car park and had to perch on the verge in the hopes someone would let us in soon lest we block the roads. Luckily, a lovely man in his tractor opened the gates shortly after 9am and we accessed the car park. Not knowing what else to do, and because we’re British, a queue started to form. So yes, we stood in it. At 10am a lovely man with flowers in his wide brim hat bid us entry after our £2.50 entry fee. Being in a field and all, it’s cash only so be sure to bring some money with you. 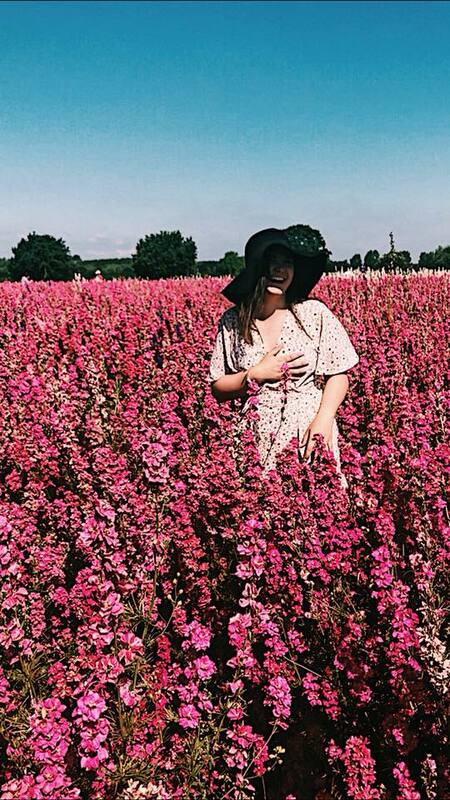 You may think, what am I going to do in a field full of flowers? Well, let me tell you. Photographs, and lots of them. You’ll become a model to rival Gigi Hadid and you didn’t even know it! 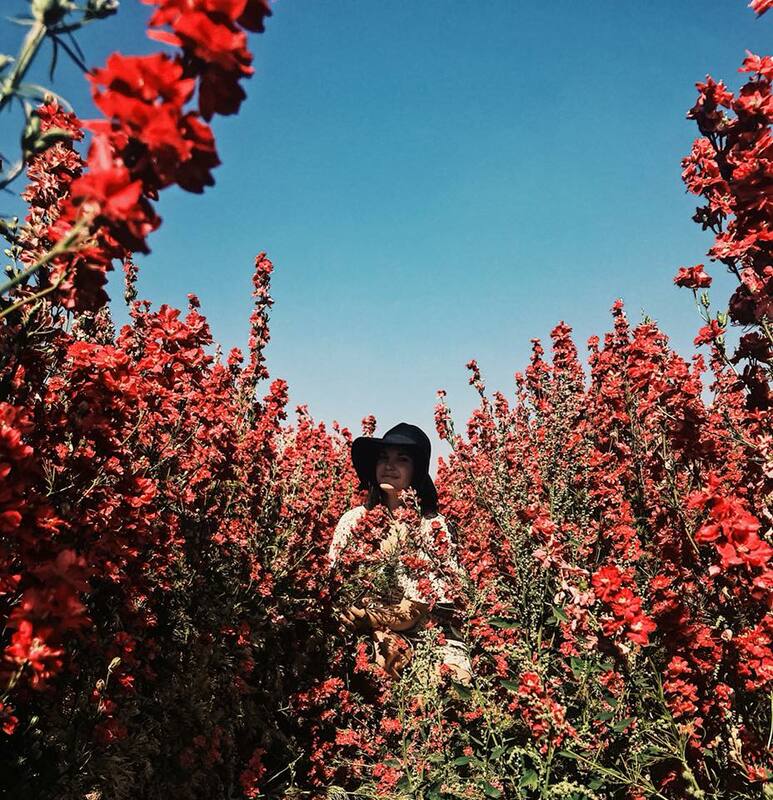 The time soon flies by as you meander around the different shades of flower, stopping for a selfie or five. But all jokes aside, the flowers are the living crop of the business. There are no roped areas, and you are expected to walk along the dirt pathways, but not between the flowers themselves. While they anticipate that the crop nearest these dirt roads is likely to be deadened, they do ask that you don’t walk too far into the flowers. So be sure to stay near the front, and take care not to trample the crop. I promise these flowers were already trampled and I’m not breaking the rules! 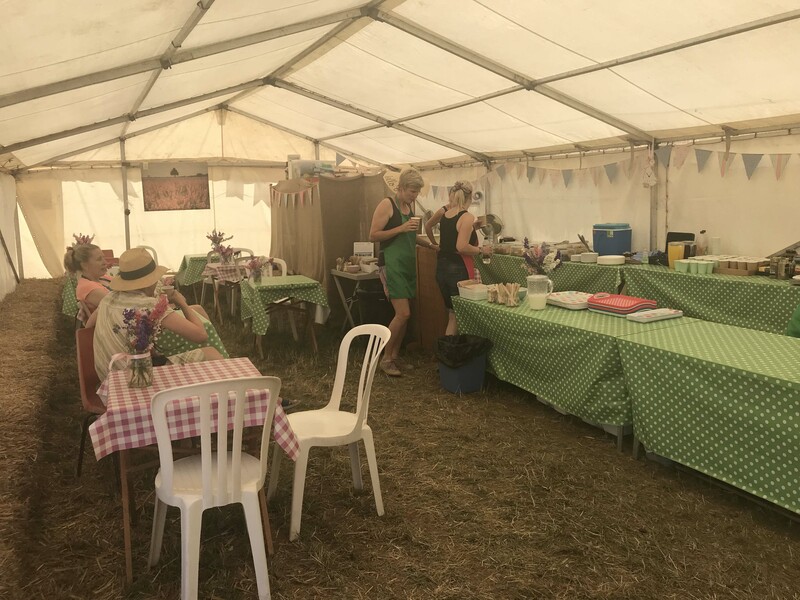 The confetti cafe is on site selling all manner of cakes, but plan ahead and bring your own picnic. There isn’t a huge space to sit down inside the marquee, however tables and chairs are provided outside. I’d recommend bringing a picnic blanket and finding a shaded spot under a tree facing the crop. Check when the flower fields will be open, and plan ahead. If you’re visiting during peak times, get there early but no more than one hour before opening.